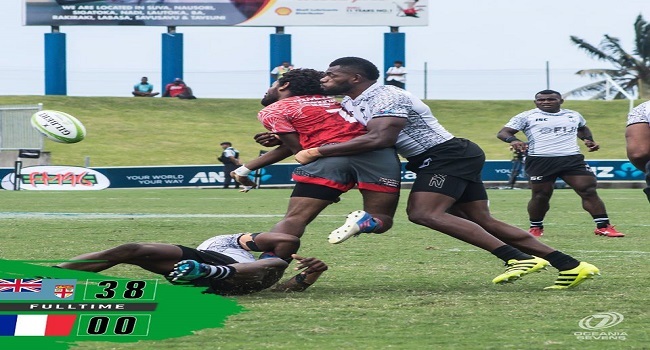 The Fiji Airways 7s team has advanced to the cup semi-final of the Oceania 7s championship underway at Suva’s ANZ Stadium. The Gareth Baber-coached side defeated New Caledonia 33-0 in the first cup quarterfinal today. Fiji will play Samoa at 3:33pm in the cup semi-final. The first semifinal sees Australia takes on New Zealand at 3.12pm. In other quarterfinals, Australia beat Tonga 19-7, New Zealand outclassed PNG 44-0 while Samoa defeated Cook Islands 19-12. Meanwhile, the Fiji Airways Fijiana takes on Australia in the cup semi-final at 1.27pm while New Zealand meets PNG at 1.06pm.